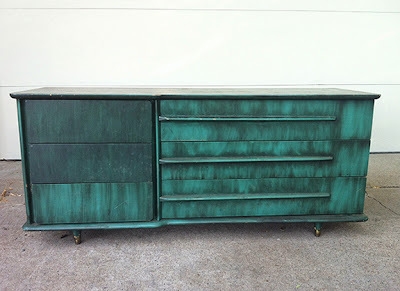 Scored this amazing dresser at an estate sale early this summer for only $20. Finally got around to painting it a lovely grey/blue. Plus a couple coats of polyurethane for a little gloss. It goes with my Great Grandmother's picture so nicely. Best part, it fits all of my art and design supplies, definitely beats the plastic tubs I used before. 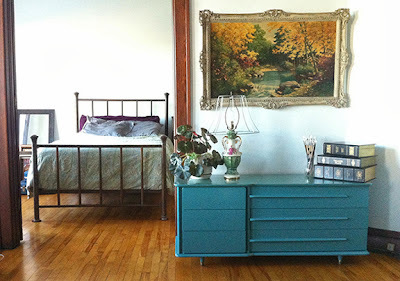 You can also see the brass bed frame that I got from another estate sale for only $35. Estatesales.net is my new best friend. Kudos to my Mother for both of the estate sale finds, and to my Father for all the supplies and fixing/welding the bed-frame!